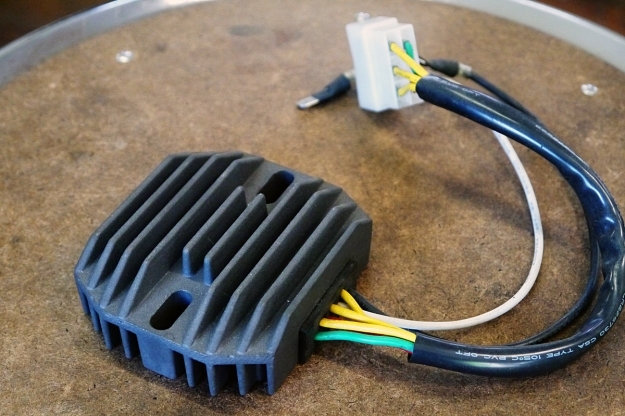 THE MOST OVERLOOKED, FORGOTTEN, OR AVOIDED aspect of building a custom motorcycle has to be the electrical system. You can spend lots of time and money building a high performance engine or sculpting beautiful lines. But if there’s no spark, you just built a really nice paperweight. We’re going to trash that one and start from scratch with a bare-bones basic harness—one that’s just enough to get you on the road, and should work for most vintage bikes. A new modern regulator/rectifier. This takes the AC current produced by the stator and changes it to DC current to charge the battery. It will also keep the voltage from getting too high and frying your system. Most often you can find it under the seat area or under one of the side covers. It’s a critical part of your charging system—and the easiest part to upgrade. The old ones worked poorly to begin with, and chances are, the stock one is dead or on its way out. Replacing points with electronic ignitions. These send the signal to the coils telling them when to fire the spark plugs. While a traditional points ignition works fine when adjusted properly, it does require periodic maintenance and the know-how to get it dialed in just right. For this reason many riders choose to upgrade to an electronic unit that is mostly maintenance free once installed. The most common of these are the Pamco and Dyna(below) units. They’re relatively affordable and produce great results. They also eliminate the old condensers, which often fail. For those with larger budgets or dreams of racing there are higher end optical ignitions like Power Arc which give the most precisely timed spark for optimal power. A brand new battery. Most street bikes won’t run without one and if the charging system was week or the bike sat for a long time, don’t take the chance. Just replace it. Quality wire and connectors. 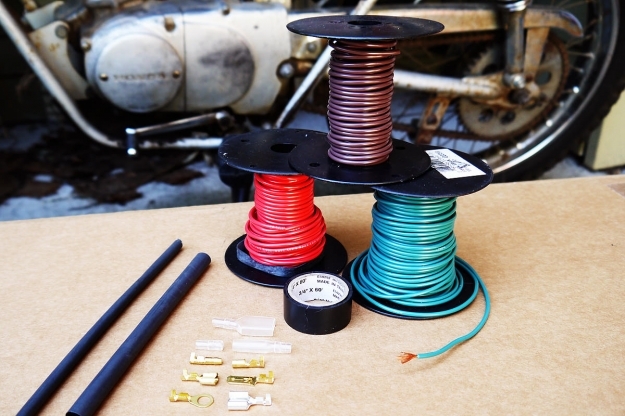 I recommend at least 16-gauge thin stranded copper primary wire. Never use solid core made for home wiring (I’ve seen it done). 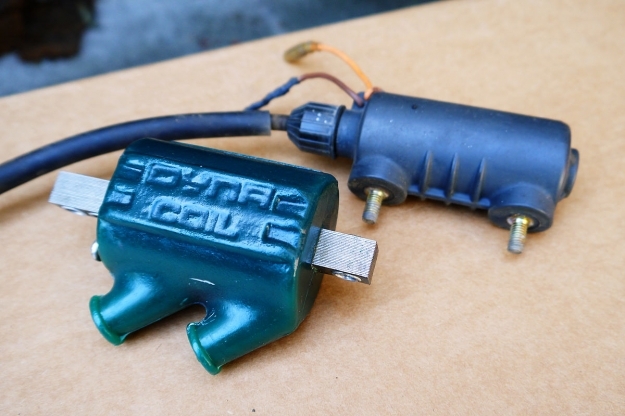 Speaking of blank, nothing says “I built my bike at Home Depot and Pep Boys” like those red and blue crimp connectors. Optional goodies for the ambitious. These aren’t completely necessary but any time you can eliminate a possible failure point in your electrical system, you’ll be ahead of the game. New ignition coils. These produce the power to fire the spark plugs. They’re usually found under the gas tank. 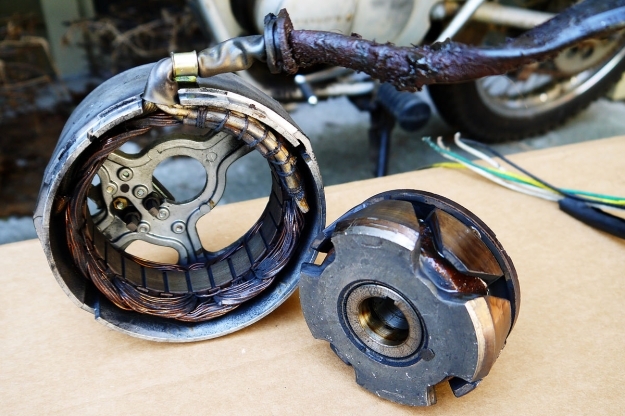 Most running motorcycles still have perfectly good coils that will function well with newer electronic ignitions. However, if your plug wires are damaged or you suspect a failure, it’s always a good idea to replace them with something new. While companies like Dyna make very good coils, I’ve had plenty of success with less expensive options like Emgo. Don’t expect aftermarket coils to match up to you stock mounts. You may have to fabricate a bracket or two but they’ll still work just fine. Upgraded stator. 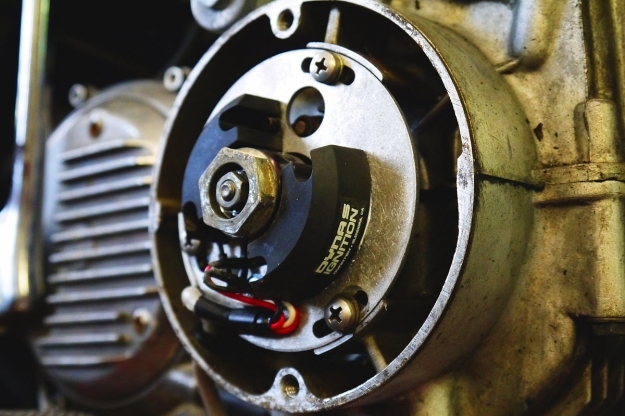 The stator produces the power to run your electrical system and keep your battery charged. It’s usually under the left side cover of the engine at the end of the crankshaft. Most older machines had weak charging systems to begin with, and time has only made them worse. 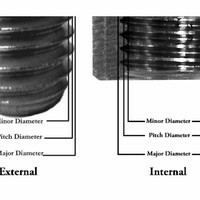 If you find that upgrading the regulator/rectifier still hasn’t given you enough power, it may be time to look into this. It may not be available for all bikes but some of the more common ones like CB350s and XS650s can take advantage of offerings from Rick’s or Hugh’s Handbuilt. These units will put out a lot more charging power and in some kickstart only cases, allow you to run without a battery. 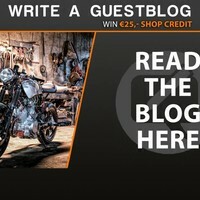 Motogadget accessories. 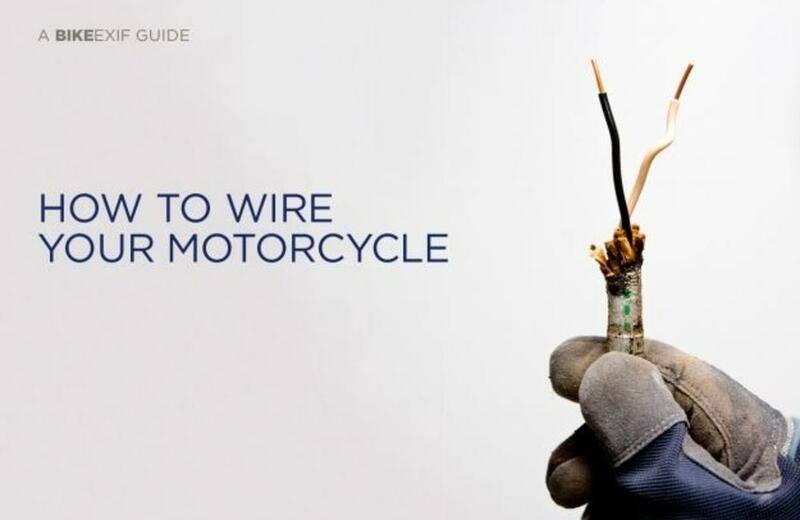 Ah, the pièce de résistance or gold standard for motorcycle wiring. When you’ve spared no expense on your build and want a professional looking installation, Motogadget parts are the ones you reach for. 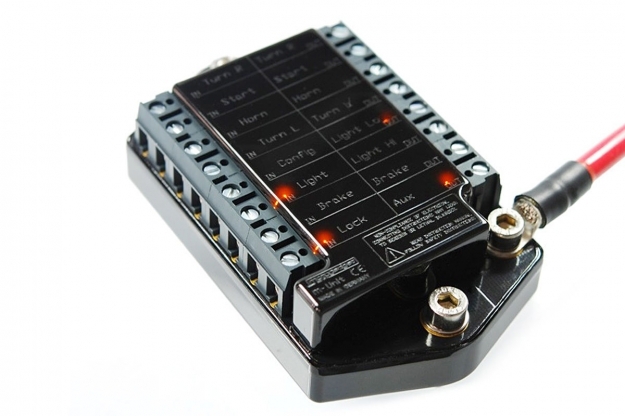 The m-Unit is a self contained, programmable, and well-labeled electrical heart for the wiring system. It uses electronic circuit breakers, making fuses obsolete. 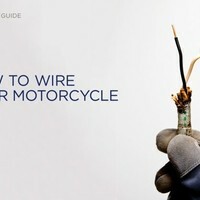 Just hook it up to your battery then run wires out to every electrical component on the bike. Headlight, taillight, turn signals, horn, the lot. There’s even an integrated alarm feature. Definitely plug and play for someone with a little patience and a free weekend. Motogadget also offers options for electronic flashers, digital gauges, and my personal favorite, RFID keyless ignition.